The Gorgons, three terrifying creatures in Greek mythology, were sisters named Stheno (strength), Euryale (wide-leaping), and Medusa (ruler or queen). Daughters of the sea god Phorcys and his sister and wife, Ceto, they lived in the west near the setting sun. According to legend, the Gorgons were ugly monsters with huge wings, sharp fangs and claws, and bodies covered with dragonlike scales. They had horrible grins, staring eyes, and writhing snakes for hair. Their gaze was so terrifying that anyone who looked upon them immediately turned to stone. Two of the Gorgons, Stheno and Euryale, were immortal, but Medusa was not. In one of the more famous Greek myths, the hero Perseus* kills and beheads her with help from Athena*. The goddess later placed an image of Medusa's head on her armor. The three Gorgons were called Stheno, Euryale, and Medusa. Their gaze was so terrifying that anyone who looked at them turned to stone. 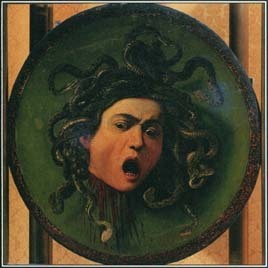 Caravaggio painted this shield with the face of Medusa in the 1590s. The Gorgons had three sisters known as the Graeae ("the gray ones"). These old women—Enyo, Pemphredo, and Deino—shared one eye and one tooth, and they took turns using them. The Graeae guarded the route that led to their sisters, the Gorgons. Perseus, however, stole their eye and tooth, forcing them to help in his quest to find and kill Medusa. See also Greek Mythology ; Medusa ; Perseus .